SUPERMIX equipments specializes in manufacturing and supplying a qualitative range of Mild Steel Silo. The offered mild steel silo range is manufactured using high-grade material at our multifaceted infrastructure facility that is equipped with latest machines. These mild steel silo products are capable of bulk filling applications in vast capacities. 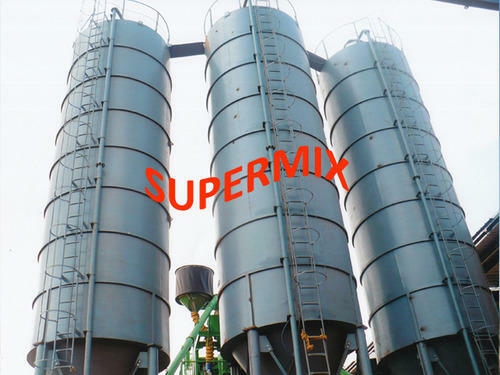 Established in the year 2013, we, “SUPERMIX Equipments” hold expertise in manufacturing, supplying, trading and exporting a commendable range of Cement Silo & Accessories, Concrete Mixer and Industrial Valve, Conveyor & Concrete Plant. Under this range, we offer Cement Silo, Silo Aeration System, Silo Venting Filter, Silo Level Indicator, Pressure Relief Valve and Conveyor System. Along with this, we offer Fly Ash Brick Plant, Concrete Batching Plant, Pan Mixer, Aggregate Feeding Rotary Belt Conveyor, Aggregate Feeding Belt Conveyor and many more. These aforementioned products are meticulously fabricated using supreme quality basic material, sourced from the accredited vendors of the industry. The offered products are designed and developed while taking into consideration defined parameters of the industry along with prevailing market demands. Furthermore, all our products are featured with several attributes such as longer service life, excellent performance and robust construction. All our products are available with us in different technical specifications and designs that can be customized as per the clients' requirements. Along with this, we offer after sales service for the offered range. We are provide one stop solution for concrete batching plant support equipment right from foundation plan & location marking to successful commissioning.